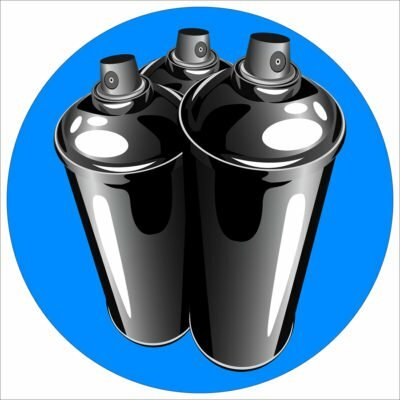 You need the best spray paint for wood furniture when restoring tables, chairs and more. We recommend these top rated products. Don’t get rid of those old pieces of wood furniture! There are some easy ways to restore them using the best spray paint for wood furniture. The key to completing a quality project is researching the different brands and finding the options that will be best for your needs. Then, those projects will be done in a fraction of the time and you’ll be left with new, restored looking furniture. Is Spray Paint the Best Way to Revive Old Furniture? How Do I Spray Wood Properly? Experts know that using spray paint is a great way to finish wood projects with ease. It is an efficient way of painting and provides highly professional-looking results. Spray paint also helps to achieve the high-gloss, lacquer finish that many people desire. According the the Home Dweller blog, chairs and recliners need taking care of and restoring these items can feel like similar to purchasing a brand new one. The trouble with using spray paint cans comes when you have to do large areas at a time. First, it will begin to hurt your finger holding those triggers down for so long. In addition, it can become pricey buying all the paint cans. In these circumstances, it would be a good idea to consider using a spray paint gun with regular paints. Of course, this will produce some setup and cleanup tasks for you, but you’ll be left with a professional looking finish. In addition, it will still be quicker than using paint brushes. When painting wood furniture, follow these easy steps to get the job done right. Make sure you have all the supplies you need before you start painting. This part of the preparation is key to a successful project. Consider buying a mask, sandpaper, primer and of course, your spray paint. Do not buy cheap brands of spray paint because they are not going to give you the finish you are looking for. Brands like Krylon or Rust-Oleum may cost a little more, but it will be worth it. The piece of furniture that is getting painted must be clean and free of any cracks or loose pieces. Tighten those screws and fix any structural concerns. Sanding your furniture is also a good idea for the best finish. Generally, you’ll use a medium to high-grit sandpaper. Pay close attention to any inconsistencies in the wood or rough areas. Sand in the direction of the wood grain. Once the sanding is complete, wipe the piece down with a damp cloth and remove all the dust. Plan to spray in a well-ventilated area and wear your mask at all times. Cover any nearby surfaces that you don’t want to paint. Spray paint has a tendency to travel. Other than sanding, priming is the next most important part of your job. This will help to ensure an even coverage and allow the paint to adhere properly. Cover the furniture with long, even strokes of primer. Wait until that coat dries and then add another. If there are any bubbles or inconsistencies in the job so far, be sure to briefly sand them again. Do not move onto the next step until the primer has completely dried. This is the job you’ve been waiting for. Start spraying with long, even strokes. Be sure that the can isn’t held too close to the furniture of you could end up with built-up paint. Don’t try to cover it all in the first coating. Pay attention to corners, ornate details, and arms. Keep in mind that it can look stripy after the first coat and this is completely normal. Thankfully, it normally only takes 10 minutes or less for spray paint to dry. Once that coat has dried, you can add another coating. Then, allow the paint to completely dry before moving on any further. Not every project you work on will require sealing. If you are working on a high-use piece like the dining room table, use a polyacrylic coat to keep it lasting longer. It won’t take long and the reward will be worth it. Keep in mind that most of these steps will not apply when simply spraying a piece of wicker furniture. When searching for the best spray paint for wood, there are five products you’ll want to check out. These are all highly recommended for a high-quality job. The Rust-Oleum spray paint offers a comfort spray tip and can be sprayed from any angle. It is fast drying and comes in a variety of colors. With this spray, you have the ultimate in hiding power. In addition, you can complete those jobs fast and with ease. It will resist chipping and fading over time. Rust-Oleum Painter’s Touch isn’t just for wood furniture. Use it on baskets, doors, cabinets, metal furniture, shutters, trim, and plaster as well. For the low price, it is easy to use this paint on all of your household projects without breaking the bank. This version of Rust-Oleum is ideal for both interior and exterior use. Virtually any surface will benefit from this paint including wood, plastic, wicker, plaster, metal and unglazed ceramics. With this spray, it is easy to achieve long-lasting protection. In addition, you can spray from any angle with comfort since this formulation offers less finger fatigue. The paint will dry to the touch in just 20 minutes and one can is capable of covering 12-square feet. There are also a variety of colors available to allow for a durable and smooth finish. The glossy coverage allows a fresh shine on most surfaces for a professional looking application. This Painter’s Touch provides ultra cover up to 2x the amount of competitor brands. It is also the best formula for hiding imperfections. Use this on wood, metal, plaster or wicker for superior coverage. As with the other Rust-Oleum products, this also offers the comfort spray tip and the ability to spray from any angle. There are many popular colors available and the formula will dry fast. The paint resists chipping and fading over time. This formula seems to cost slightly more than many of the others, but you won’t have to apply so many coats, so it all seems to work out. The Krylon brand offers an elegant design and superior finish. It is manufactured in the U.S. and features the EZ Touch 360-degree dial spray tip for easy application. Unlike some brands, this formula features the non-yellowing moisture resistant finish. Both bare and painted surfaces will receive permanent protection from this brand. To get the job done quickly, the paint dries in just 10 minutes or less. In addition, it can be used on most surfaces including glass, wood, metal, paper crafts, and wicker. There are more colors available than I can even count, perfect for any project. If you are hoping for a metallic finish on your furniture, this is a great option. This Rus-Oleum formula works on almost any surface including plastic, wood, metal, fiberglass, concrete, vinyl and wicker. This is an oil-based application that provides for superior adhesion. It also prevents rust, and resists chipping and fading over the long haul. The fast-drying formula dries to the touch in just 30 minutes and will cover up to 15-square feet per can. Use this anywhere you want an attractive, shimmering metallic look. As you can see, there are some superior options available when you are in search of the best spray paint for wood furniture. You can choose virtually any color and finish for a personalized look. Spray your wood furniture, wicker, and other household items to give a fresh, new look to an entire room.